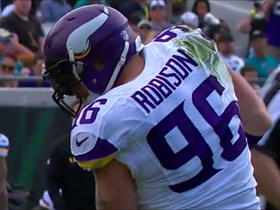 Robison was released by the Vikings on Saturday, ESPN's Adam Schefter reports. Analysis: Despite re-structuring his contract to remain in Minnesota, the organization elected to part ways with the 35-year-old defensive end after 11 seasons together. Robison saw a major decline in his snap count last year, but still managed to rack up 20 tackles and four sacks in 15 games. The Vikings will clear just over $1 million in salary cap space with his release. Robison said that this season would "more than likely" be his last, Chris Tomasson of The Twin Cities Pioneer Press reports. Analysis: Robison is entering his 12th NFL season. 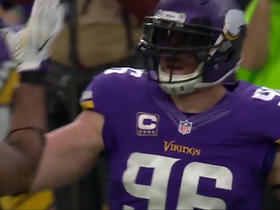 He's played all of them for the Vikings and has been a consistent contributor along the defensive line. The veteran lineman said that he would have a definite answer regarding his pending retirement in August, but it would be a surprise to see him take the field again in 2019. Robison is again slotted to be a backup defensive end after wracking up 4.0 sacks in 2017. Robison racked up four sacks and 20 combined tackles in 2017. Analysis: Robison's tackles and sacks were his fewest since 2010. The veteran still managed to play in 15 regular season games, a number he hasn't dipped below his entire career. With Everson Griffen and Danielle Hunter the now starting on the edges, Robison has moved into more of a backup role on the defensive line, a position he should find himself in again during the final year of his contract in 2018. Robison accounted for his third tackle of the postseason, but the Eagles' backfield racked up 110 yards on the ground against the Vikings in Sunday's 38-7 blowout. 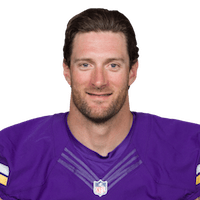 Analysis: Robison has seen his role diminish in his 11th year as a Viking, starting in just one game after starting in all 51 of Minnesota's regular-season and postseason games between 2013 and 2016. As the only remaining member of the 2009 team that reached the NFC championship, Robison will look to help guide this third-ranked scoring defense back to the playoffs in 2018. Robison had four total tackles and two sacks in Sunday's win over the Bengals. Analysis: Robison has seen his playing time decline this season as the Vikings try to keep him fresh at age 34. However, he can still make an impact in the pass rush. Robison (back) is active for Thursday's game against the Lions. Analysis: After fully participating in Wednesday's practice, Robison has officially been made active for Thursday's matchup with Detroit. Robison will once again be used as a reserve defensive end alongside Stephen Weatherly. Robison (back) is listed as questionable for Thursday's game against the Lions. Analysis: Robison wasn't able to play Week 11 against the Rams but seems likely to suit up this time around after practicing without limitations Wednesday. If Robison is unavailable, Stephen Weatherly will presumably take on added snaps again. Robison (back) is inactive for Sunday's game against the Rams, Chris Tomasson of the St. Paul Pioneer Press reports. Analysis: The loss of Robison will be offset by the return of Everson Griffen after he missed one game with a foot injury. Robison (back) didn't practice Friday and is listed as questionable for Sunday's game against the Rams, Chris Corso of the Vikings' official site reports. 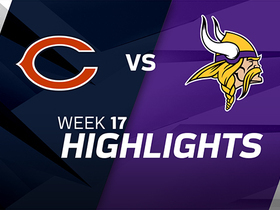 Analysis: Robison has been playing very high snap counts as the Vikings' No. 3 defensive end, but he only has 11 tackles (seven solo) and one sack to show for it. If he's unable to play Sunday, Stephen Weatherly could see increased action as the Vikings aim to contain Rams running back Todd Gurley. 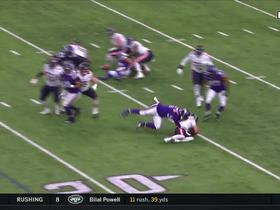 Minnesota Vikings defensive end Brian Robison chases down Mitchell Trubisky for sack. 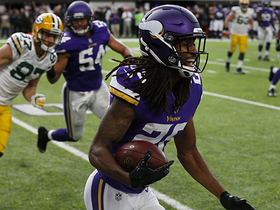 Minnesota Vikings cornerback Trae Waynes intercepts a pass after Green Bay Packers quarterback Brett Hundley is hit hard letting go of the ball. 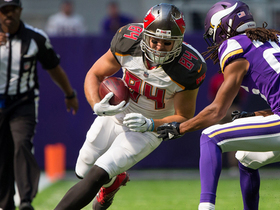 Tampa Bay Buccaneers tight end Cameron Brate bails out quarterback Jameis Winston by snatching a ball away from a defender on a potential interception. Chicago Bears QB David Fales sacked for a 5-yard loss. 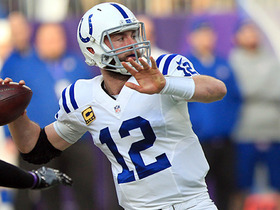 Indianapolis Colts quarterback Andrew Luck finds wide receiver T.Y. Hilton for 31 yards. Jacksonville Jaguars QB Blake Bortles sacked for a 7-yard loss. 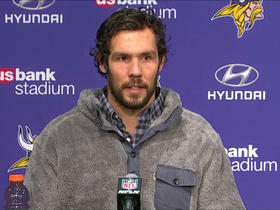 Minnesota Vikings QB Sam Bradford and defensive end Brian Robison react to the team's Week 13 loss. 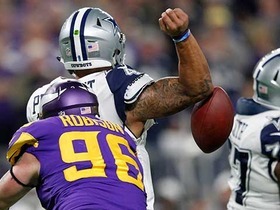 Dallas Cowboys QB Dak Prescott is strip sacked by Minnesota Vikings defensive end Brian Robison and the Vikings recover the fumble. 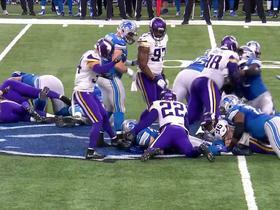 Vikings defensive end Brian Robinson helps stop Lions running back Zach Zenner on fourth down.